The last time I watched Clermont play Ulster, I was in Bono's Octagon Bar in Dublin, sipping on a Grey Goose martini, with an afternoons worth of shopping bags scattered at my feet. Last night, I watched the two square off again, but instead of snacking on vodka soaked olives, I had a plate of homemade crêpes courtesy of Papa's Wife stacked in front of me, and a bottle of Médoc to wash them down with. And for the record, I have no idea which setting I prefer more... my inner city girl is all over the martini soaked bar scene, but my cozy side loved watching it at Papa's house with a sleeping Ruby cuddled up next to me. It's a bit like Sophie's Choice really. My heart belongs to these two. And it's OK, The Husband totally understands. That there on the right is Julien Pierre. He's as tall as a tree and I kind of want to climb him. And that's all I'm going to say about that. Just how I like my crêpe... I'm a Nutella girl. While The Husband may smear one crêpe with confiture de fraise, and then another with miel (that's strawberry jam and honey), before finally succumbing to the sweet charms of Nutella (and by the way, The Husband had four while I was still finishing one... oink oink), I go straight for the Nutella every time. And sometimes I'll throw a large dollop of Crème Chantilly on there for good measure. In for a penny, in for a pound I say. Any thoughts on crêpes or rugby players? My husband's a lemon and sugar guy (he's thin) but I like Nutella, too (I'm not so thin.) There may be a lesson for me there. We love ourselves some rugby and root for France if Ireland is out of the picture. 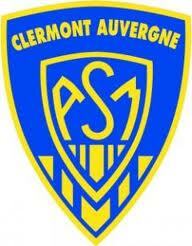 Well done, Clermont, by the way! When Ireland and France play I have no idea who to root for and end up a nervous wreck! Same for Clermont vs. Leinster... I'm like a headless chicken! I'm curious why January = crepes in France. There's a huge display at the supermarket as if we're all supposed to be crepe-ing. I never had a crepe. We sell some at my store, but from what I hear the brand is very iffy. I don't understand why crepes haven't "caught on"
Trendy and daring! But in Europe eating crapes is like a way of life! I personally like them savory with ham and mushroom and cheese! Going to the rugby in Scotland or Ireland is brilliant fun! When I was single we (chums) loved going to Scotland v France as there were always lots of handsome Frenchies there. I love crepes too, but I've never made them, that's the sort of thing I would eat three times a day. Good Lord give me some crepes! I don't know much of rugby but of crepes I do. With wine I have never tried but I am willing. OH yes, willing. holy crap those crepes look good - haven't had them in forever! 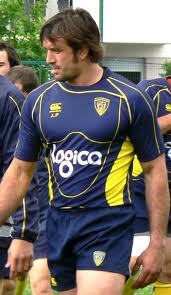 and, i dont really watch rugby but dang, such a manly sport! Well I live with a female rugger who makes delicious crepes, so it's all good. But crepes are especially good with jam for me. Martini soaked bar scene or bottle of Médoc with Papa? Honestly, they both sound good! "He's as tall as a tree and I kind of want to climb him." <-- hilarious! I don't watch rugby, don't understand a thing about it... but I'd love some nutella on my crepe! Or I could take it with just sugar. Mmm! Love it! I am all about Rugby, the sexiest sport ever where men are real men. Oh man did I miss this sport when I was back in the states. I'm sure glad I can be fulfilled now while back in France! I might have a slight Nutella problem. Haha. Now crêpes sound amazing! was there something else? oh, i almost forget...the NUTELLA. This made me want a banana and nutella crepe bad. SO BAD!! I always have Nutella in my pantry... just in case I get a craving that cannot be stopped! A few years ago it was more difficult to find, but now we can get it in the grocery. Crepes? Banana+Nutella and always with ice cream! The Grey Goose and hunka-hunka are pretty fine, too! 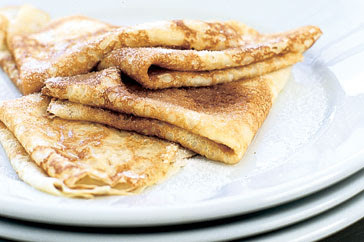 Ah my favorite crepes ever are just butter sugar and cinnamon! All I've got to say about Julien Pierre is: I'd like to smother him in nutella and then do filthy things to him. Dayum. Ohhh how I LOVE Nutella! Ah! A fellow Nutella lover. You had me at "nutella." You obviously know the way to a girl's heart.